The very interesting booklet note by Mark Kluge that accompanies this CD focuses quite strongly on the relationship between Bruno Walter and Arturo Toscanini. They first met in 1929 and the relationship seems to have been one of mutual regard and respect. One product of the relationship was an invitation to Walter to conduct a series of concerts with Toscanini’s newly-formed NBC Symphony Orchestra. 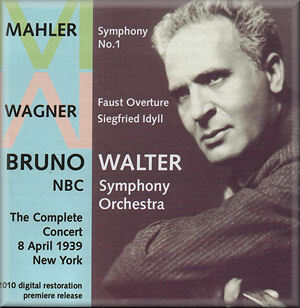 Walter led five programmes with the orchestra in March and April 1939 and this disc gives us the opportunity to hear the last of these programmes. The table suggests that Walter is significantly more spacious in his treatment of the first and last movements in 1961 as compared to 1939. I don’t necessarily suggest that one approach is ‘better’ than the other but it’s fascinating to compare and contrast. The start of II is very strongly delineated. Indeed, some listeners may feel the music sounds a bit aggressive. My suspicion is that this is due to the closeness of the sound in Studio 8H. However, the music making is urgent and dynamic and that’s certainly down to Walter and his players – and I like it. I also like the way Walter imparts a beguiling lilt to the trio. In III the playing is, once again, very responsive and sounds completely idiomatic – note the use of portamento. One has the impression that though the orchestra may have been collectively new to Mahler’s First they had been schooled in it by a master. From 5:49 onwards the ‘Lindenbaum’ episode sounds seductive and refined. The finale erupts. Walter and his players achieve a fiery, dramatic opening which must have rocked the audience back in their seats – in 1961 Walter was also very fine at this point and his performance is presented in much better sound, of course, but his 1961 interpretation is somewhat broader and the 1939 traversal has an animal energy and greater thrust and it’s enormously compelling. The players respond with great commitment. This is real edge-of-the-seat stuff and, indeed, at around 2:00 the music momentarily threatens to run away with itself. But it’s not all about raw energy: the great D flat melody (from 3:01) is beautifully judged – Walter plays it with warmth and breadth but skilfully maintains momentum. When the maelstrom of the opening is revisited (6:10) the performance has tremendous drive and Walter’s audible encouragement to the players can be heard. The calmer waters between 10:00 and 13:36 provide an atmospheric period of repose and then there’s excitement and grandeur in the concluding few minutes. This highly dramatic reading of the finale caps a memorable account of the symphony as a whole. The remainder of the programme is devoted to Wagner. The Faust Overture isn’t a piece that really excites me but Walter gives a taut reading. Mark Kluge points out that the only studio recording that Walter made of the piece was an acoustic one way back in 1923 so this New York account is a valuable entry into the conductor’s discography. Kluge describes Walter’s interpretation of Siegfried Idyll as ‘tender yet flowing’ and I certainly can’t improve on that. Walter conveys the lyricism and open-heartedness of the piece and gets refined and intimate playing from the orchestra. This is an important issue for admirers of this great conductor. The audio side inevitably has some limitations, as one would expect given that the performances took place over seventy years ago. However, the sound is pretty decent and has been transferred well by Aaron Z Snyder. It’s wonderful to find this example of Walter’s artistry speaking powerfully to us seventy-two years later. The documentation is well up to the high – and thoughtful – standards of this label.